Eligibility requirements for enhanced warranties vary. See table below for information. Complete the online rebate claim form. Include your System Plus, Silver Pledge or Golden Pledge Warranty Number in the space provided. The Qualifying Individual’s name and address on warranty registration must match the information on the rebate claim form and name on proof of military service. A printed rebate claim form confirmation page. Active military personnel must submit legible copy of a Leave and Earnings Statement. Veterans and Retirees must submit a copy of a DD Form 214. Please remove your social security number or the document will be immediately destroyed and you may be disqualified from receiving a rebate at GAF’s sole discretion. 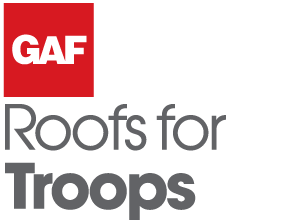 GAF must receive your rebate claim within 90 days of the roof installation date. Additional Terms: Offer valid in the U.S. only. Void where prohibited. Limit one rebate per Qualifying Individual and per address. Allow 8 weeks from receipt of claim for shipment of rebate check or as otherwise required by law. GAF is not responsible for lost, late, misdirected, incorrect, incomplete, illegible, damaged, or postage due mail/requests, or for technical errors that may affect the submission, receipt, or processing of rebate requests. Claims received after deadline, incomplete submissions, illegible submissions, or submissions that do not comply with these terms will be rejected and will not be returned. Please keep a copy of the documents you submit for your records. GAF reserves the right to audit all rebate claims, and improper redemption or use constitutes fraud. GAF is not responsible for any rebate check that is lost or stolen. 1Active members, veterans, and retirees of the U.S. military who are legal residents of the U.S. (each, a “Qualifying Individual”). 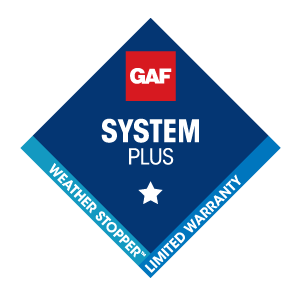 2A GAF roofing system consists of GAF asphaltic roofing shingles and a specified number of qualifying GAF accessory products, which varies based on the enhanced warranty selected. 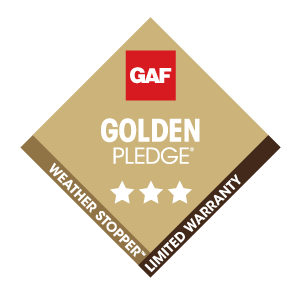 Qualifying GAF accessory products include: (1) ridge cap shingles; (2) Cobra® Attic Ventilation; (3) starter strip shingles; (4) roof deck protection; and (5) leak barrier. Visit gaf.com for product information. GAF roofing system must be installed by 12/31/19 on a home in the U.S. owned by a Qualifying Individual. 3Eligibility requirements for enhanced warranties vary. See table above for information and visit gaf.com to view full enhanced warranties, which include additional requirements, restrictions, and coverage details. Enhanced warranty must be registered by contractor within forty-five (45) days of roof installation. It is your contractor’s responsibility to register your warranty within 45 days of installation. 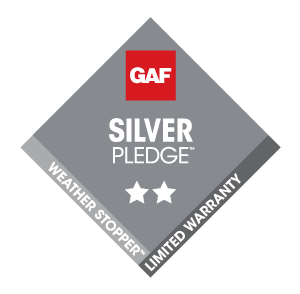 If you have not received your warranty from GAF within 60 days, you should call GAF at 1-888-532-5767, option 5. From time to time we may update this Site and these Terms. Your use of this Site after we post any changes to these Terms constitutes your agreement to those changes. You agree to review these Terms periodically to ensure that you are familiar with the most recent version. ST&P may, in its sole discretion, and at any time, discontinue this Site or any part thereof, with or without notice, or may prevent your use of this Site with or without notice to you. You agree that you do not have any rights in this Site and that ST&P will have no liability to you if this Site is discontinued or your ability to access the Site or any content you may have posted on the Site is terminated. Content on this Site that is provided by ST&P or its licensors, including certain graphics, photographs, images, screen shots, text, digitally downloadable files, trademarks, logos, product and program names, slogans, and the compilation of the foregoing ("ST&P Content") is the property of ST&P and its licensors, and is protected in the U.S. and internationally under trademark, copyright, and other intellectual property laws. You agree not to download, display or use any ST&P Content located on the Site for use in any publications, in public performances, on websites other than this Site, for any other commercial purpose, in connection with products or services that are not those of ST&P, in any other manner that is likely to cause confusion among consumers, that disparages or discredits ST&P and/or its licensors, that dilutes the strength of ST&P's or its licensor's property, or that otherwise infringes ST&P’s or its licensors’ intellectual property rights. You further agree to in no other way misuse any ST&P Content or Third Party Content that appears on this Site. If you are a trademark or copyright owner and you believe that your trademark or copyright rights have been violated, please go to our Proprietary Rights Complaint Process [insert link to Complaint Process form] and follow the instructions at that area. The following requirements apply to your use the Site: (a) you will not use any electronic communication feature of the Site for any purpose that is unlawful, tortious, abusive, intrusive on another's privacy, harassing, libelous, defamatory, embarrassing, obscene, threatening, or hateful; (b) you will not upload, post, reproduce, or distribute any information, software, or other material protected by copyright or any other intellectual property right (as well as rights of publicity and privacy) without first obtaining the permission of the owner of such rights; (c) you will not collect or store personal data about other users; (d) you will not use the Site for any commercial purpose not expressly approved by ST&P in writing; (e) you will not upload, post, email, or otherwise transmit any advertising or promotional materials or any other form of solicitation or unauthorized communication; (f) you will not upload, post, email, or otherwise transmit any material that contains viruses or any other computer code, files, or programs which might interrupt, limit, or interfere with the functionality of any computer software or hardware or telecommunications equipment. From time to time on certain areas of our Site you may be able to submit written posts and certain other materials ("User Content"). By using these features, you agree that you will not post any content that is unlawful, harmful, tortious, defamatory, libelous, obscene, invasive of the privacy of another person, threatening, harassing, abusive, hateful, racist, infringing, pornographic, violent or otherwise objectionable or inappropriate as determined by ST&P; that you will not post any content that contains personal information about any individual, violates the privacy/publicity of any other individual or entity, or anything that you are under a contractual obligation to keep private or confidential; that you will not impersonate any person or organization, including without limitation, the personnel of ST&P, or misrepresent an affiliation with another person or organization; and you will not post any content that contains viruses, corrupted files, or any other similar software or programs that may adversely affect the operation of the Site, or feature of the Site. You further understand and agree that you have no ownership rights in materials you submit to us, to any account you may have with us, or other access to the Site or features therein. ST&P may cancel your account and delete all User Content associated with your account at any time, and without notice, if ST&P deems that you have violated these Terms, the law, or for any other reason. ST&P assumes no liability for any information removed from our Site, and reserves the right to permanently restrict access to the Site or a user account. By displaying, publishing, or otherwise posting any User Content on or through the Site, you hereby grant to ST&P a non-exclusive, sub-licensable, worldwide, fully-paid, royalty free license to use, modify, publicly perform, publicly display, reproduce, and distribute such User Content in any and all media now known or hereinafter developed without the requirement to make payment to you or to any third party or the need to seek any third party permission. This license includes the right to host, index, cache, distribute, and tag any User Content, as well as the right to sublicense User Content to third parties, including other users, for use on other media or platforms known or hereinafter developed. You continue to retain all ownership rights in your User Content, and you continue to have the right to use your User Content in any way you choose, subject to these Terms and the license described herein. You represent and warrant that you own the content submitted, displayed, published or posted by you on the Site and otherwise have the right to grant the license set forth herein, and the displaying, publishing or posting of any content you submit, and our use thereof does not and will not violate the privacy rights, publicity rights, copyrights, trademark rights, patents, contract rights or any other intellectual property rights or other rights of any person or entity. You agree to indemnify and hold ST&P, its clients and their respective parents, subsidiaries, officers, employees and website contractors and each of their officers, directors, employees and agents harmless from any claims, damages and expenses, including reasonable attorneys’ fees and costs, related to your violation of these Terms, including the Posting Policy, or any violations thereof by your dependents or which arises from the use of User Content your submitted, posted or otherwise provided to ST&P or this Site. ST&P makes no representations about the reliability of the features of this Site, the Content, User Content, or any other Site feature, and disclaims all liability in the event of any service failure. You acknowledge that any reliance on such material or systems will be at your own risk. ST&P makes no representations regarding the amount of time that any Content or User Content will be preserved. ST&P does not endorse, verify, evaluate or guarantee any information provided by users and nothing shall be considered as an endorsement, verification or guarantee of any User Content. You shall not create or distribute information, including but not limited to advertisements, press releases or other marketing materials, or include links to any sites which contain or suggest an endorsement by ST&P without the prior review and written approval of ST&P. THIS SITE IS PROVIDED ON AN "AS IS, AS AVAILABLE" BASIS. NO WARRANTIES, EXPRESS OR IMPLIED, INCLUDING BUT NOT LIMITED TO THOSE OF MERCHANTABILITY OR FITNESS FOR A PARTICULAR PURPOSE, ARE MADE WITH RESPECT TO THIS SITE OR ANY INFORMATION OR SOFTWARE THEREIN. UNDER NO CIRCUMSTANCES, INCLUDING NEGLIGENCE, SHALL ST&P BE LIABLE FOR ANY DIRECT, INDIRECT, INCIDENTAL, SPECIAL, PUNITIVE, OR CONSEQUENTIAL DAMAGES THAT RESULT FROM THE USE OF OR INABILITY TO USE THIS SITE, NOR SHALL ST&P BE RESPONSIBLE FOR ANY DAMAGES WHATSOEVER THAT RESULT FROM MISTAKES, OMISSIONS, INTERRUPTIONS, DELETION OF FILES, ERRORS, DEFECTS, DELAYS IN OPERATION OR TRANSMISSION, OR ANY FAILURE OF PERFORMANCE WHETHER OR NOT CAUSED BY EVENTS BEYOND ST&P’S REASONABLE CONTROL, INCLUDING BUT NOT LIMITED TO ACTS OF GOD, COMMUNICATIONS LINE FAILURE, THEFT, DESTRUCTION, OR UNAUTHORIZED ACCESS TO THIS SITE'S RECORDS, PROGRAMS, OR SERVICES. UNDER NO CIRCUMSTANCES, INCLUDING BUT NOT LIMITED TO A NEGLIGENT ACT, WILL ST&P OR ITS AFFILIATES OR AGENTS BE LIABLE FOR ANY DAMAGE OF ANY KIND THAT RESULTS FROM THE USE OF, OR THE INABILITY TO USE, THE SITE, EVEN IF ST&P HAS BEEN ADVISED OF THE POSSIBILITY OF SUCH DAMAGES. SOME JURISDICTIONS DO NOT ALLOW THE LIMITATION OR EXCLUSION OF LIABILITY FOR INCIDENTAL OR CONSEQUENTIAL DAMAGES; AS A RESULT, THE ABOVE LIMITATION OR EXCLUSION MAY NOT APPLY TO YOU. Both you and ST&P acknowledge and agree that no partnership is formed and neither of you nor ST&P has the power or the authority to obligate or bind the other. These Terms will be governed by and construed in accordance with the internal laws of Ohio without regard to conflicts of laws principles. By using this site, you hereby agree that any and all disputes regarding these Terms will be subject to the courts located in Ohio. These Terms operate to the fullest extent permissible by law. This Policy describes our privacy practices for the websites and apps where it is posted. This policy does not apply to information we may collect in offline or in other forums. Contact information. For example, we might collect your name and street address. We might also collect your phone number or email address. Information you submit or post. For example, if you submit a online sweepstakes entry or complete an online rebate form, we will collect the information you provide to us. We collect information directly from you. For example, if you submit an online sweepstakes entry or complete an online rebate form. We also collect information if you post a comment or make a request. We use information to respond to your requests or questions. For example, we might use your information to fulfill your rebate or enter you into a sweepstakes. We use information to improve our products and services. We might use your information to customize your experience with us. We use information to look at site trends and customer interests. We may use your information to make our website better. We may combine information we get from you with information about you we get from third parties. We use information to send you transactional communications. For example, we might send you emails about your rebate request or sweepstakes entry. We might also contact you about this policy or our website terms. We may share information with third parties who perform services on our behalf. For example, we may share information with vendors, or authorize them to collect information on our behalf. Some vendors may be located outside of the United States. You can opt out of receiving our marketing emails. To stop receiving our promotional emails, follow the instructions in any promotional message you get from us. Don't worry! Even if you opt out of getting marketing messages, we will still be sure to send you transactional messages. If you reside in California, you have the right to ask us one time each year if we have shared personal information with third parties for their direct marketing purposes. To make a request, please send us an email, or write to us at the address listed below, Attn: [insert]. Indicate in your letter that you are a California resident making a "Shine the Light" inquiry. Our sites and apps are meant for adults. We do not knowingly collect personally identifiable information from children under 13 without permission from a parent or guardian. If you are a parent or legal guardian and think your child under 13 has given us information, you can email us here. You can also write to us at the address listed at the end of this policy. Please mark your inquiries "COPPA Information Request." Our site may also serve third party ads or content that contain their own cookies or tracking technologies. We do not control the use of those technologies. We may work with online advertising companies to show you relevant and useful ads. This may include ads served on our own websites or apps. This may also include our ads served on other companies' sites. These ads may be based on information collected by us or third parties (for example, when you register for a site). These ads may also be based on your activities on our websites or on third party sites. This second type of advertising is called "online behavioral advertising." To opt out of having your online behavioral advertising, click here.